On 23 and 24 September the first Access to Seeds Index Round Table conference was organized in Addis Ababa. Goal of the Round Table was to collect input from farmers’ representatives for the development of the Index. After earlier phases of desk research, surveys and expert consultation, this Round Table was the first dialogue meeting on the Access to Seeds Index. The aim of the conference was threefold: (1) to discuss and identify the daily challenges that farmers face in access to quality seed, (2) to develop a common understanding of the concept of ‘access to seeds’ and (3) to identify what farmers expect from leading seed companies in light of their daily challenges and the common understanding of ‘Access to Seeds’. 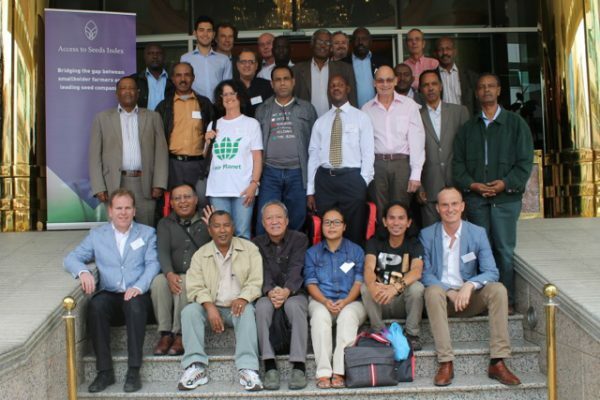 In close cooperation with Agriterra eleven representatives of farmers’ organizations from Latin America (2), West Africa (2), East Africa (4) and Asia (3) were invited to participate in the conference. To prepare for this conference they were asked to consult their organisations on the three main questions addressed. Also representatives of four NGO’s, two research institutes, four local seed companies and participants with a seed industry background were invited to enrich the dialogue in the conference with insights from their respective backgrounds. As the Round Table was hosted in Ethiopia, it started off with opening speeches by an official of the Agricultural Transformation Agency of Ethiopia, a representative of the Ethiopian Seed Association and the Agricultural Counsellor of the Netherlands Embassy to Ethiopia. In a second round of presentations, the initiative to develop the Access to Seeds Index was introduced, a senior researcher of Bioversity presented an overview of the challenges in global food security and climate change and FairPlanetSeeds gave a presentation of their project in Ethiopia bridging the gap between global seed companies and the smallholder farmer. After the presentations, the participatory part of the Round Table started. This part consisted of four rounds of plenary in-depth interviews with the farmers’ representatives on their daily challenges, a plenary prioritizing of the identified challenges, two rounds of rotating group discussions to create a common understanding of ‘access to seeds’ and a brainstorm on initiatives that leading seed companies can take to bridge the gap with smallholder farmers in the developing world. To bridge this Round Table with the Industry Round Table in Washington DC on 23 October, Julian Kinderlerer, emeritus professor of the University of Cape Town was invited to participate in the conference and report its findings in Washington DC. Orlando de Ponti, former president of ISF and chair of the Industry Round Table also participated in the Ethiopia Round Table.